Flawless® is the revolutionary facial hair removal device that erases hair instantly and painlessly without the irritation that comes with plucking, waxing or depilatories. 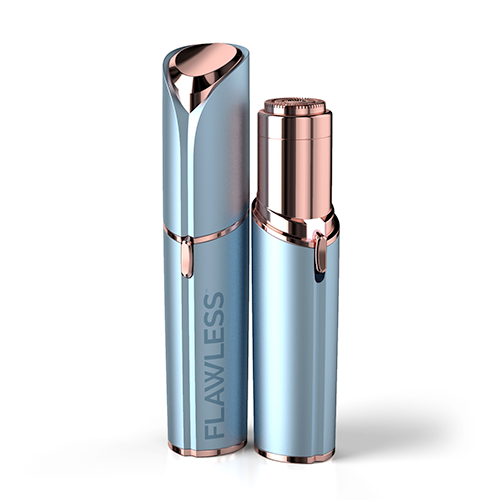 Flawless is designed to look like a lipstick but contains the finest German engineered technology that microscopically removes hair. You can be "flawless" anywhere, anytime. For best results, we recommend replacing the heads of your Finishing Touch® Flawless® every 3-6 months. You can get a two-pack or four-pack of replacement heads! Works with all Flawless® colors & battery operated and rechargeable units! Does Flawless® shave the hair or pull it out by the root? The secret is a revolutionary Butterfly™ Technology that erases hair by microscopically paring it down through a spinning head. Neatly and discreetly housed under the 18 karat gold-plated head, the Butterfly™ Technology never touches delicate facial skin. Dermatologist approved, Flawless® is not a laser, hot wire, epilator, or razor. It is safe on all skin types and tones. Are the hairs eliminated using a light feature, laser, or heat? No, Finishing Touch® Flawless® does not use a laser or hot wire. The revolutionary Butterfly™ Technology erases hair by microscopically paring it down to the surface of the skin. It is safe on all skin types and tones. Dermatologist approved, Flawless® is not a laser, hot wire, epilator, or razor.